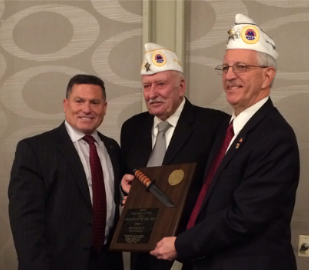 The AMVETS Department of Ohio presented its “Legislator of the Year Award” to Rep. Rick Perales (R-Beavercreek) on Saturday at its annual mid-winter conference. Representative Perales retired from the United States Air Force in 1997, his military career culminating as Commander of the 788th Civil Engineer Squadron at Wright Patterson Air Force Base. In 2013, Representative Perales sponsored House Bill 325 which would have clarified Ohio law with regard to video forms of charitable gaming. While the bill expired in committee, AMVETS Department of Ohio wanted to recognize Representative Perales for his commitment to helping veterans’ organizations.